River of Life Mission prepares food and futures for those in need. There’s a place in Chinatown gathering lots of attention. Among the mom and pop cafés, hot new Asian-fusion bistros, hipster coffee shops, and vegan cocktail lounges, guests from all walks of life gather here. It is open three times a day, for breakfast, lunch, and dinner, and serves anywhere from 100 to 300 guests per meal. That’s around 15,000 meals a month. When you walk past, there are often people lined up outside the door. Despite the high demand, meals here are free. For those who grew up in Hawai‘i, the meals served here, at the River of Life Mission, evoke nostalgia. The kitchen cooks up dishes like chicken long rice, stir-fry, chicken adobo, and spaghetti and meatballs, in addition to salads and vegetarian options. Holidays here can be a real treat, too, when prime rib or shrimp scampi might be served for dinner. At River of Life, you never know what the chefs might serve you, as the menu changes daily. 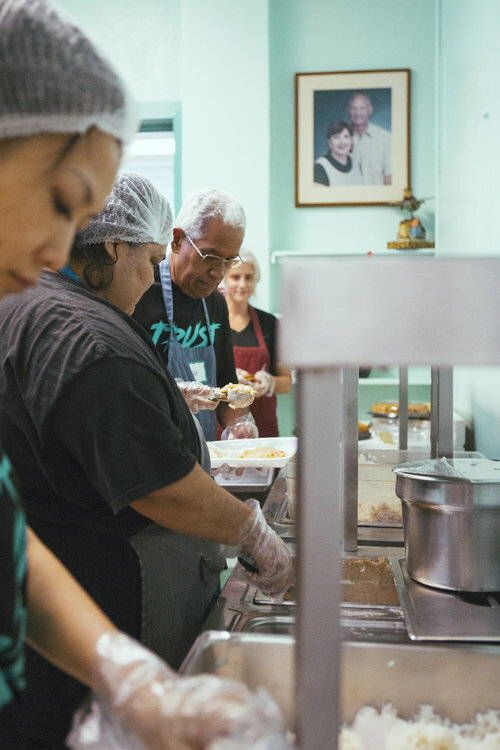 A faith-based nonprofit, River of Life has been feeding those in need on O‘ahu since 1985. It was started out of the back of a car, from which its founders, Jack and Audrey Stankus, served up tuna and peanut butter and jelly sandwiches. When Jack and Audrey saw that a space on Pauahi Street was available for rent, they jumped at the chance to meet the needs of a growing urban population. They transformed the location from a former peep show joint into a place to get meals, boxes of food, clothing, showers, and haircuts. Over the years, the organization’s services grew to include access to social workers, chapel services, Bible studies, and counseling. However, none of the guests that come in are required to attend the religious services offered. Diners at River of Life include students needing a meal, homeless patrons, and others who have full-time jobs but are living paycheck to paycheck. Eighty percent of River of Life funds come from individual monetary donations; it receives no assistance from the state or federal government. Most donated food items are given during the holiday season. They also receive donations in the form of toiletries, apparel, and miscellaneous appliances throughout the year. “Food is a great medium to help others,” says director of operations Shervelle “Shevy” Gardner, who has been with the mission for 13 years. “The mission wants people to have a positive identity and to know that there is a plan for their life.” Excess food and ingredients are sorted into food boxes for the elderly, delivered to housing projects throughout the island, or handed off to welfare offices who do outreach. A wide variety of people are fed, clothed, and provided access to basic hygiene products—services often overlooked by the more fortunate. 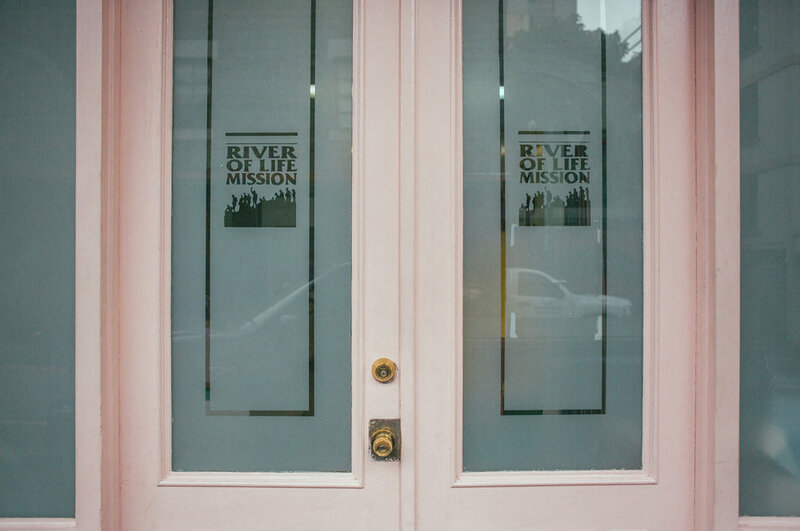 Alongside free meals for those in need, the mission also operates a chocolate factory, Chocolate on a Mission, which produces assorted treats like chocolate-covered cookies and chocolate bars. 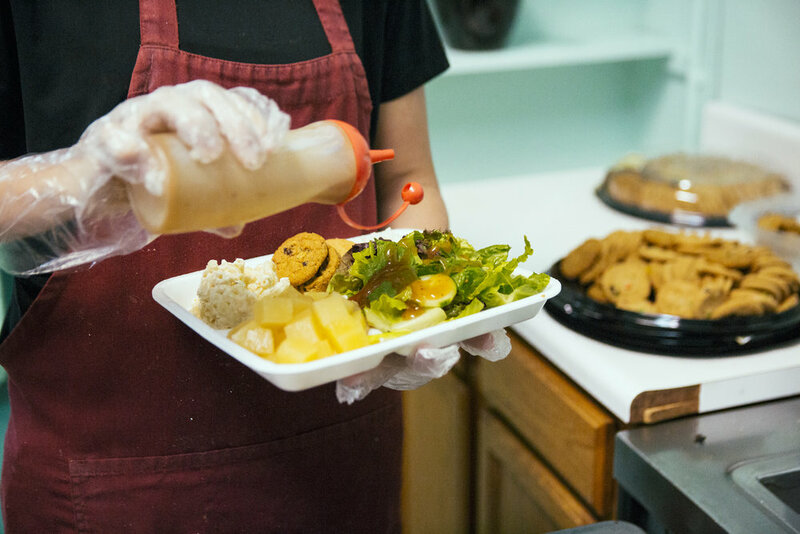 More importantly, Chocolate on a Mission provides on-the-job training and employment experience for those recently released from prison or recovering from drug or alcohol addiction. This opportunity is vital to reintegrating these individuals—many of whom have difficulties finding employers willing to give them a chance—as contributing members of society. Hilda Gibson (shown abolve), a food director at the River of Life Mission, experienced this firsthand. Released from prison in July 2010, Gibson went right into one of the mission’s job training programs. Once homeless and living on the beach, she lost a lot of things many people take for granted. She needed necessities like shampoo, toilet paper, and toothpaste while getting her life back on track. When she came to the mission, she received support and gained the courage to do bigger things. 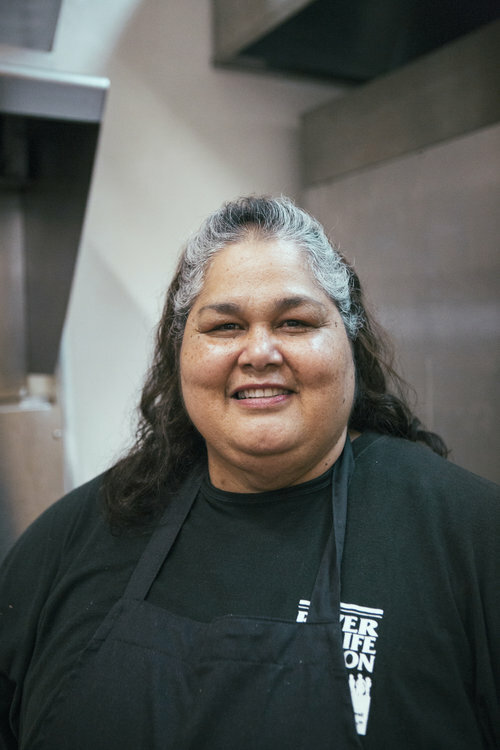 Hilda now has a culinary degree from Kapi‘olani Community College, where she graduated with a 4.0 GPA. River of Life is located at 101 N. Pauahi St. For more information, visit riveroflifemission.com.